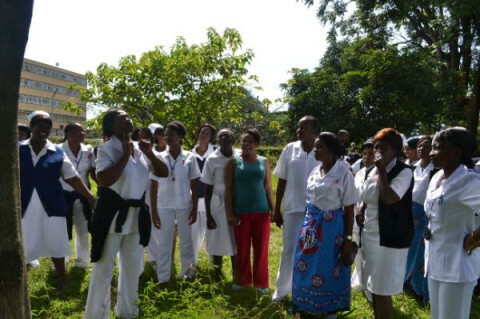 Zambia Episcopal Conference (ZEC) has called on government to expedite the process of reinstating the fired nurses who took part in last year’s strike. Zambia Congress of Trade Union (ZCTU) Secretary General Roy Mwaba was quoted in some sections of the media saying nineteen (19) out of the five hundred (500) nurses who were fired for going on an illegal strike last year have died as a result of depression. Speaking to qfm news in an interview, ZEC General Secretary Father Cleophas Lungu says life is precious and the sick need the nurse’s care and love. Father Lungu explains that the issue now is for government to have a heart for the many patients that have been affected because they may die for lack of nursing care and attention. He says the life of the delicate sick in many health centers is more important hence the need for government to reconsider having more nurses back at work. Father Lungu notes that even before some nurses were dismissed, the health sector has been facing serious challenges because the nurses are not enough to handle the many patients hence the need to forgive them so as to save lives. Next articleIs Sondashi Formula solution to Zambia’s economic ills?